It started at Thanksgiving dinner: screaming, crying, punching. At least that is what they think happened; their evidence was the bruises left behind. What they knew for certain was that Selena and her mom engaged in one of their worst fights ever—and all because they drank alcohol after taking their prescribed medication, Xanax. The label of prescription Xanax bottles clearly states not to mix alchohol, however, a dealer of the drug explains that students often do not follow those instructions. Xanax on college campuses increased by 450 percent from 1993 to 2005 and it continues to increase. For many students, college is a time of exploration, which often includes experimenting with drugs, and where there is drug use, there are drug dealers. On college campuses, these dealers are often students. Selena is one of these students; she illegally distributes Xanax at Rollins. Selena’s mom started giving her Xanax when she was a teenager to help her cope with anxiety. As Selena recalled, the world became “clearer” and she became more “herself.” While she openly admitted to abusing Xanax in high school, she is now legally prescribed the drug. Selena is fully aware of all of the consequences of misusing and selling it to other people; although she likes to refer to it as “giving,” not selling. Carrying a controlled narcotic that is not prescribed to you is a felony offense and can also land you a DWI charge and a night in jail. From 2014 to 2016, Rollins had 25 arrests and 95 disciplinary actions for drug abuse. The safety report does not specify which drugs were involved. Selena knows the legal repercussions. She fights a mental war every day on how to handle herself and others in the “best way possible” when it comes to using the drug. While she takes it to help her cope with anxiety, she also gives a large proportion of it to her friends. Sometimes she gives it out too generously, though, and it runs out too quickly. 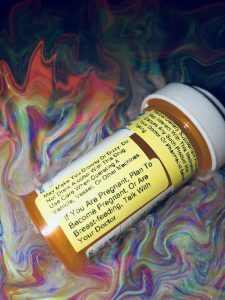 She said she gives in to her friends’ requests because she is worried about what they would buy if they were to turn to other dealers, not knowing if the Xanax others sell is real. On top of this fear, Selena claimed that it is “unavoidable” to not give her prescription to her friends at this point. Selena says that the holes in the walls you see around campus residential halls are the results of nights out drinking, usually with Xanax involved. The label on the bottle clearly indicates that Xanax is not safe to mix with alcohol because the two together will maximize the effects, creating a blackout state along with extremely impaired judgement. Xanax can be very addictive, especially when used without the advice of a professional, and has potentially life-threatening withdrawal symptoms. According to American Addiction Centers, as a central nervous system depressant, Xanax slows down a person’s heart rate, blood pressure, and body temperature while minimizing anxiety, stress, and panic. It may also be used to help reduce epileptic seizures. When the brain gets used to the drug and then is suddenly removed, these functions and conditions may rebound. Withdrawal symptoms include a person’s blood pressure, body temperature, respiration, and heart rate going up rapidly, often followed by seizures that can lead to coma and even death. Because Rollins encounters issues like these on a daily basis, there are many services offered on campus designed to help students overcome and cope with abuse and addiction. If you or someone you know is struggling with substance abuse, Rollins has many resources to help guide people through the recovery process. Counseling and Psychological Services at the Wellness Center (407-628-6340) has many qualified counselors that can help students battle abuse issues. The Office of Student and Family Care (407-646-2345) is a service designed to help students and families through the struggles of college life, using characteristics of wellness to help them achieve their goals. Using these resources can help students battle abuse problems before they take a turn for the worse. Students who have any abuse-related issues are thus encouraged to, and SHOULD, reach out to make an appointment with one or both of these offices.